I know what you're thinking. "Of course it was a special day. 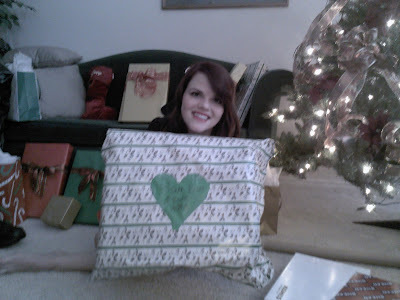 It was Christmas. Tell me something I don't know." First off, you need to ease off on the sass, and secondly there is more to yesterday than just Christmas, so listen up, will you? Yesterday was special for me because Christmas day means that I got to talk to my little sister, Mary, who is down South preaching the good word to the peeps of Argy. This year was our Christmas with Hubs' family who lives in Kaysville. Mary would be calling my mom, who lives in Orem. When I realized that I would be missing Mary's phone call I was devastated. I couldn't ask Hubs to do Christmas with my family because we did that last year and it would be selfish and unfair. But at the same time, it broke my heart to think about missing the call. So Hubs, ever the problem solver, suggested, "Why don't you just drive down Christmas day to talk to Mary and then drive back up?" By golly, I married some kind of genius! So that's how I ended up cruising down I-15 at 3:00 on a beautiful Christmas Sunday. The conversation was great. Wait, did I say great? I meant to say very very very short. Mar Mar is one of those down-the-line, exactly obedient missionaries. She believes we should always follow rules, which is the polar opposite of the rest of my family, who firmly believes we are always the exception to the rules. The two beliefs naturally clash. Mary insisted we only talk for 30 minutes, as that was the length that it says in the missionary rule book. My family has about seventeen members so that allowed roughly 1.8 minutes per person. We were all yelling to her, "Who cares Mary! Certainly there should be an exception for us! We have so many family members! We need to talk to you longer!" I was right there with them. "Mary! Talk longer to us! Come on, we're an exception, don't you know?!" But Mary refused to budge. We could talk only 30 minutes. We put her on speaker phone and gathered around the front room to hear her spunky little voice proudly announce that she has gained 15 pounds. When it was my turn I could barely even say hi. "Hey Mary. I mis...yo-...." And then I choked- couldn't get another word out. I'm just a big cry baby, but dang, I really do miss her. The conversation ended much too quickly, and before we knew it the phone had cut us off. We all sat there for a moment with Mary's voice still lingering in the room. Mom broke the silence, "Why did that conversation leave me a little sad?" We sat there for a moment and then my mom continued. "I just feel like it's so hard for her..."
"It is." A sibling spoke up. "Yep, it is. It's really hard." The rest of us chimed in, doing nothing to comfort my mom. We all served missions, and if there's one thing we know about missions, it's that they're hard. I thought back to my first Christmas on the mission. I called home on the phone in the little closet in the nearby chapel. I rememebr so distinctly the whiteness of the tiles, the heat of the day, the incredible homesickness I felt as I heard my family's voices travelling across oceans and continents to reach me. Everyone was gathered together enjoying the holiday without me. The first six months of my mission absolutely rocked me, and I was ready to call it quits and just come on home. I remember trying so hard not to cry during that conversation, to show my family how strong I was, that this tough, sassy girl was having no problems conquering Argy. I kept it together until my dad got on the phone and said sweetly, "Hi, Bop!" That's when I lost it- couldn't utter a word in reply and just let those tears stream on down my sunburnt face. I don't really understand missions. It's one of the hardest things I've ever endured, but at the same time I hold such a special place for it in my heart. I wouldn't give up my mission experiences for anything in the world. Something about the testing and the trials and the growth and the tears and the heartache attaches itself and all of a sudden it is a sacred part of you. Every day I see the influence of my mission. It influences the way I work, the way I communicate, the way I treat people, the way I live my life. I guess that is the way with anything that is "hard". It is difficult and we hate it and we wish it never happened to us, but when it comes down to it we wouldn't trade those experiences for anything because of how much we've grown and learned because of it. And that's what I'm going to remember next time I'm going through something "hard"- which always seems to come sooner than I think it will. In other news. 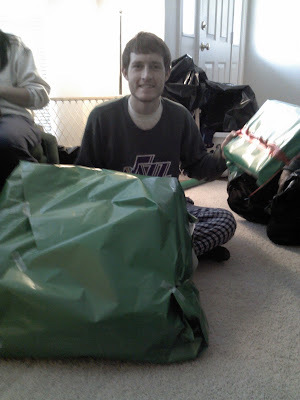 Here's some pictures of Christmas morning. My camera is out of batteries so we've been using the phone camera, which isn't nearly as good. Please accept my sincerest apologies. Yes, it looks like my head is growing out of the package. This is Hubs showing off his wrapping job. Check out the big green gift for his parents. Hey, you can't be good at everything, people. Loved it Bonnie! Thanks for sharing. I really enjoy these entries that are so sincere and heartfelt. Why did Mom and Dad have a 8th child? I can think of a couple reasons, one so you could have a companion, and two to help us remember that we are not the exceptions to every rule (although I do'n't agree with Mary on that all the time, especially for that phone call!!) there;s a good run-on sentence for you as well. Bonnie, I'm so glad you got to talk with Mary...albeit short, it was probably the best Christmas present! I love that Mary only talked for 30 minutes...I did that too on Mother's Day, but by Christmas I didn't care and talked to my family for a good two hours...not so sure Mama Sue was happy about that phone bill :) I'm glad you had a wonderful Christmas! Te quiero amiga!